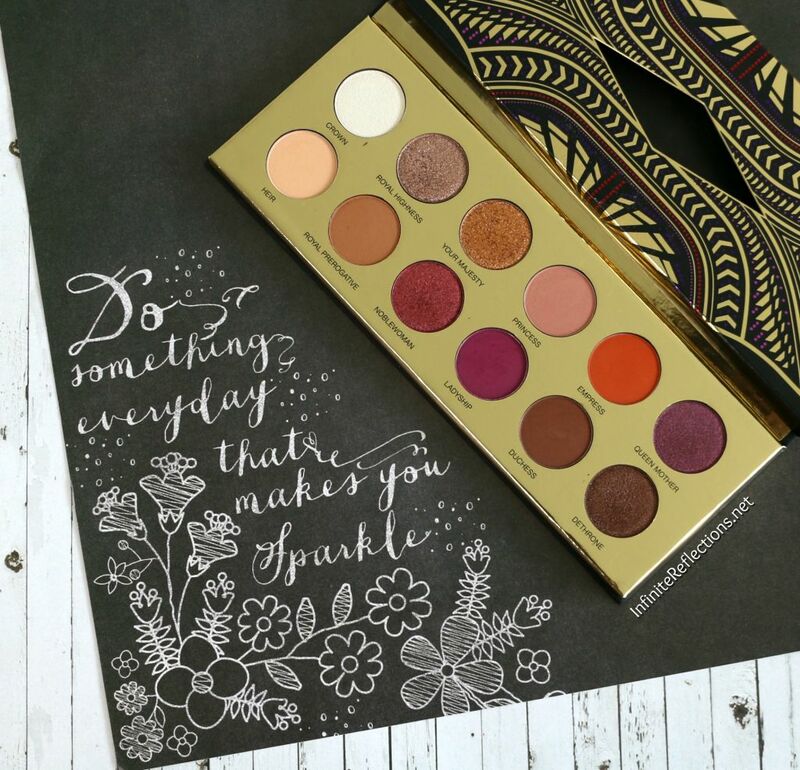 This palette is just so beautiful! If I ever create an eyeshadow palette, then it would certainly look something like this, all my dream shades in one palette. Welcome to my shortest review ever, I think, because honestly I have nothing negative to say about this palette. It’s an absolute love, let me get it out there right at the start. The packaging of the actual palette is nothing exciting really, but the sleeve, in which the palette lies, certainly makes up for it. It has a stunning pattern on the front and the back and I love the whole gold and black theme running through the palette. 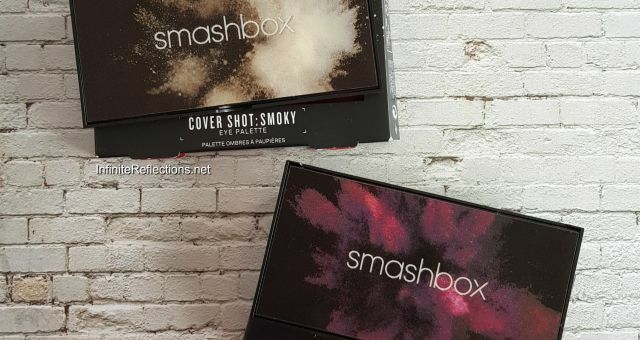 The palette has a matte black cardboard packaging, which feels really sturdy. It also has a mirror housed inside, makes it quite travel friendly, well sort of. If you don’t like to carry oversized eyeshadow palettes for your travel, then you will not like the size of the palette. It’s quite a large sized palette, compared to some of the other 12 pan eyeshadow palettes I have. So, I would have loved this to be a little smaller in size. That’s my only concern with the palette, if I have to be over critical. Here you can see the pattern running through the back. The sleeve is definitely not something to be thrown away for sure. 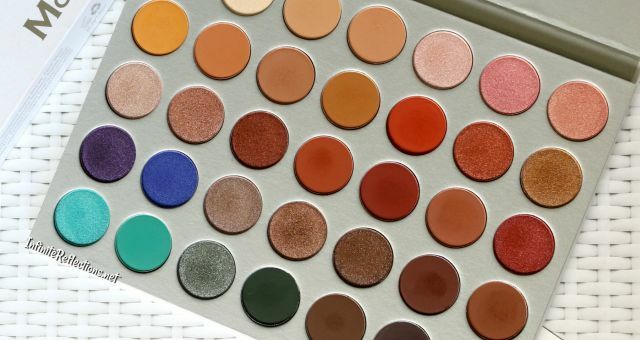 There are 12 eyeshadows in the palette and each weighs 1.5 gm / 0.05 oz, so we are getting a very good quantity of product for the price we pay. 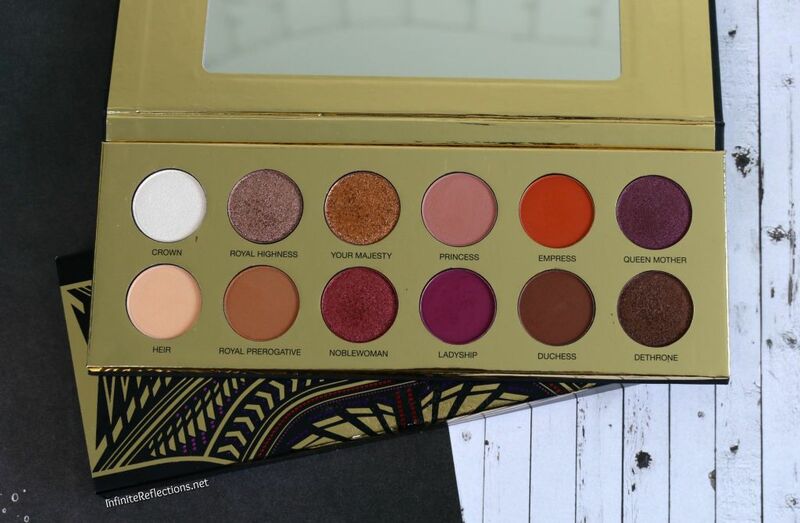 The palette is cruelty free and one of the shades in non-vegan. 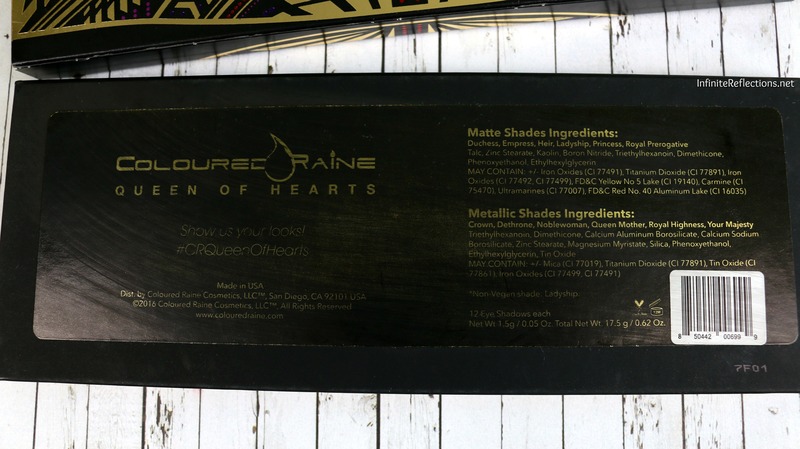 Here you can see the ingredient list of the palette. 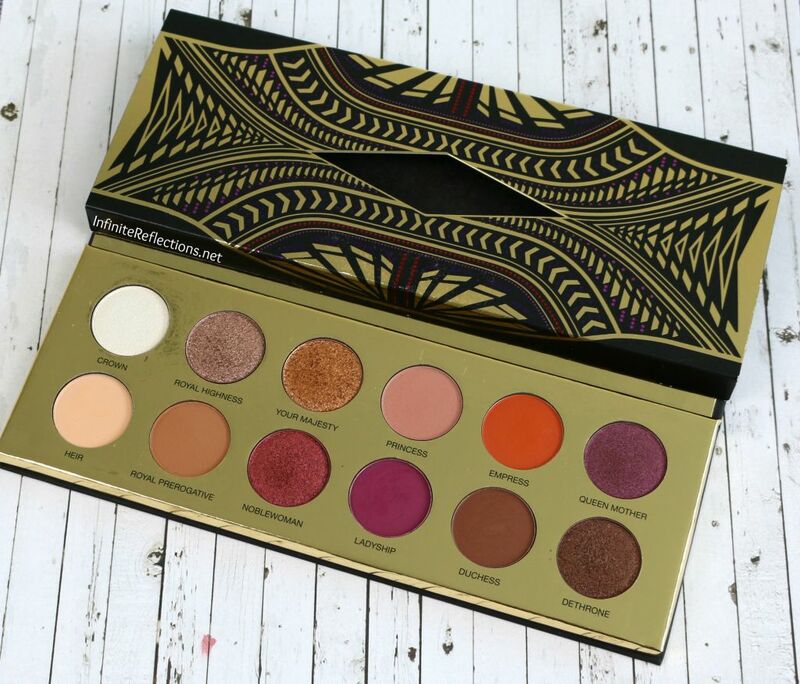 The palette costs 50 USD and can be bought from the Coloured Raine website. 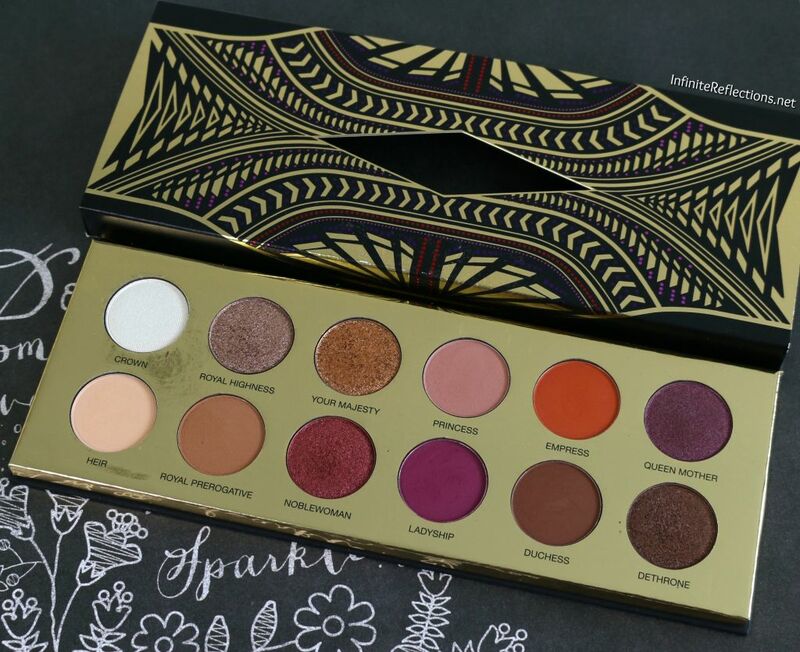 If you are outside of the USA, then you do have to factor in shipping, which is quite a lot for this palette. I bought mine from Beauty Bay for SGD 80, which works out to be close to the US price including shipping, if I had ordered directly from the Coloured Raine website to Singapore here. Honestly, I don’t mind paying that much for this palette, because it’s that good! 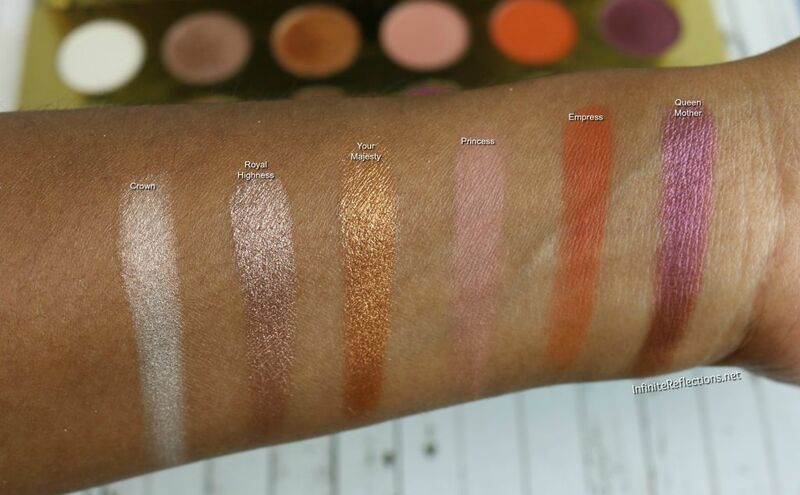 There are 12 eyeshadows in the palette and they are matte or metallic finish. As per the official website, this is how they have described the shadows. Crown – Pearlescent white with gold undertone. Royal Highness – Metallic purple-toned taupe. 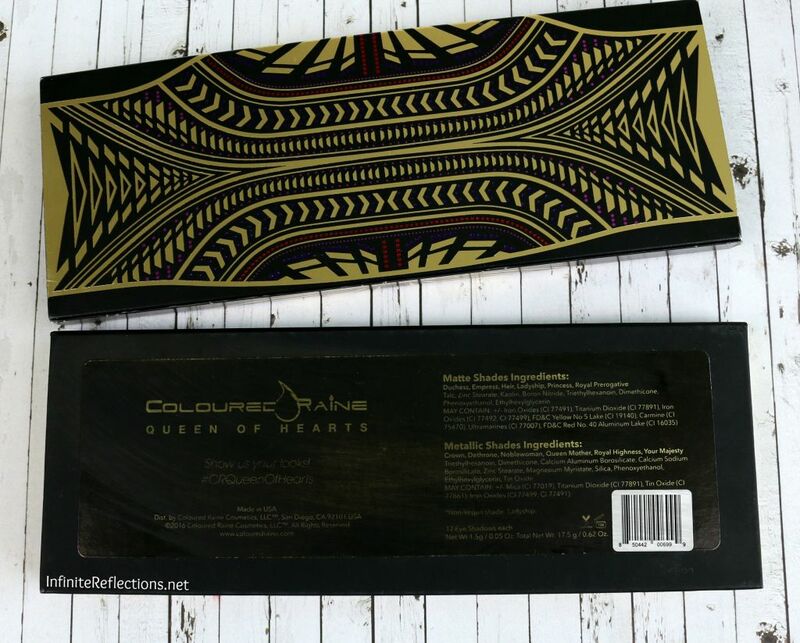 Your Majesty – Rich metallic copper with gold reflect. Princess – Matte blushed pink. Empress – Vibrant matte orange. Queen Mother – Metallic plum with lavender hues. Noblewoman – Metallic burgundy with purple undertones. Ladyship – Matte vivid purple. Duchess – Matte milk chocolate brown. Dethrone – Sparkling espresso with gold reflect. As stated before, this is going to be my shortest review ever. Everything is just amazing quality. The colour range is a dream, at least for me. I love these colours in an eyeshadow palette and thankfully all the shadows perform great on the eyes. 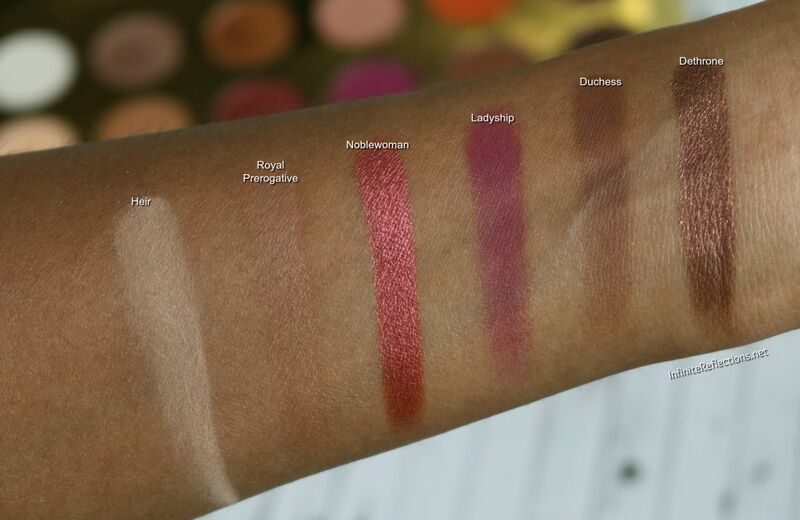 Mattes : The matte shadows have great pigmentation. You don’t need to build up the colour to get a good colour payoff. They feel smooth and buttery and they blend like a dream. The only shade which feels not as smooth as the others is “Ladyship” but it is pigmented well and works great on the eyes. I have learnt over time that purples like this always have this texture and it is difficult for them to be smooth. All that matters is how they perform on the eyes. There is no powdery-ness or chalkiness in the shadows and I haven’t noticed any kind of fallout either. Metallics : The intensity of the metallic shades can’t be described in words. They are smooth and INTENSE. They have no chunkiness or fallout, reminds me a lot of some of the Juvia’s Place metallic shades. They apply pretty well with a brush but for most intensity I apply with my fingers. They look beautiful on the eyes. The shade range of the metallic shades is also really good, so we are able to create a lot of looks. They are very long wearing too even without a eyeshadow primer. I have worn these shadows for over 5 hours without a primer and I didn’t notice much fading. So, with a primer they are definitely very long wearing eyeshadows. Row 1: If I have to pick 1, then “Royal Highness” is my favourite from this row. I love to wear taupe-y shimmers or metallic shades. Row 2: If I have to pick 1 from this row, then “Noblewoman” is just stunning. 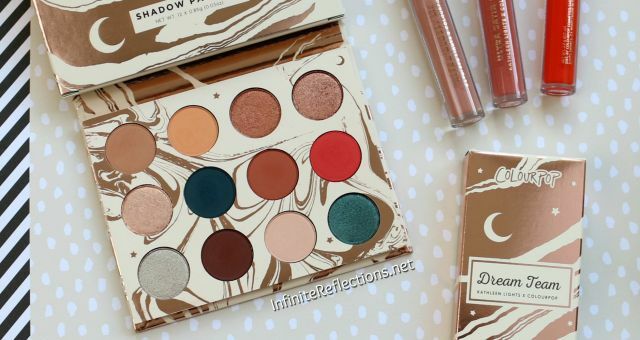 Overall, I think this is an amazing palette and the hype around it last year was very real. It is going to be a very close contest if I have to choose between ABH Modern Renaissance and Coloured Raine Queen of Hearts palettes. I am certain that anyone who loves these colours is going to fall in love with this palette. So, definitely, this one is towards the top of my recommendation list. That’s all for this post. I hope it helped. Amazing palette. I liked Queen Mother n Dethrone the most.